I first tasted these years ago at the home of a very good friend. Her mother always had a pot of these marinating in the fridge. Later, when my friend married and had her own home, she too always had a jar, tupperware container, or even a used yogurt container, marinating a batch in her fridge. My friend is Greek Cypriot and, although there have been many other dishes that I have enjoyed at either her home or her mother’s, but I have been aging a keen craving for these and decided to give them a go. Many family recipes don’t have exact measurements as they have been passed down through the generations. It’s always a “bit of this” and “three soup bowls of that” and a mug of this… but just exactly WHAT are the measurements so I can get the same results? Unless you have one of the bowls or mugs that they measured their ingredients with, you will never know. Case in point when my friend’s mother showed me how to make Greek bread one day. Her bread is amazing and fabulous with Fasolakia (a green been stew) or Louvia (a black eyed peas stew) both the perfect dish for dipping this very dense, sesame seed covered rustic bread. I have to dig through my pile of recipes as I’m positive I wrote it down on a piece of paper while I was being shown how to make the bread. The measurements for creating marinated olives really depend on the size of container that you are going to put them in. The flavour also depends on what you add and the amount of spices that you use. I would not suggest using powdered herbs and spices as they will make the olive oil look murky and I haven’t experimented enough with fresh herbs, which can produce bacteria and make you very sick if you haven’t prepared them properly. 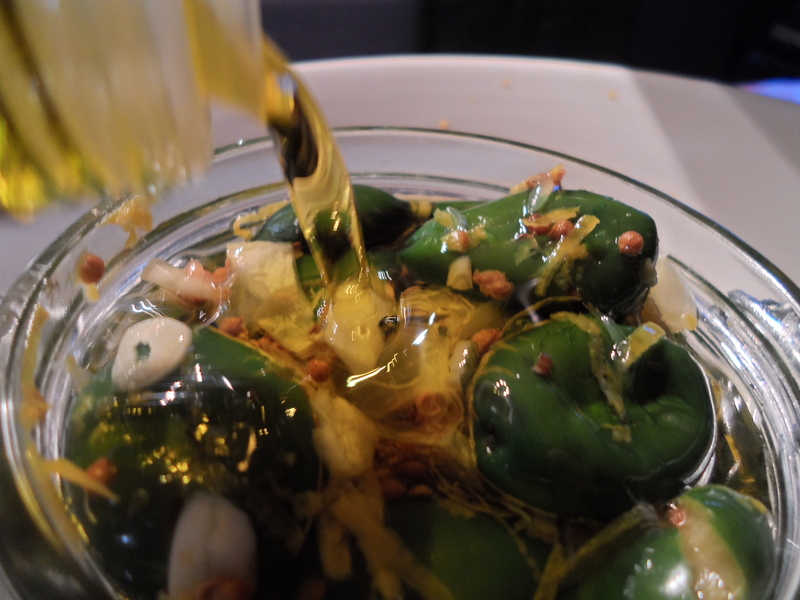 I would suggest using whole, hard spices that you can lightly crush or crack so that, over time, they will infuse their flavours into the olives and the oil. Make sure you use a good quality Extra Virgin Olive Oil that will not over power the other ingredients. 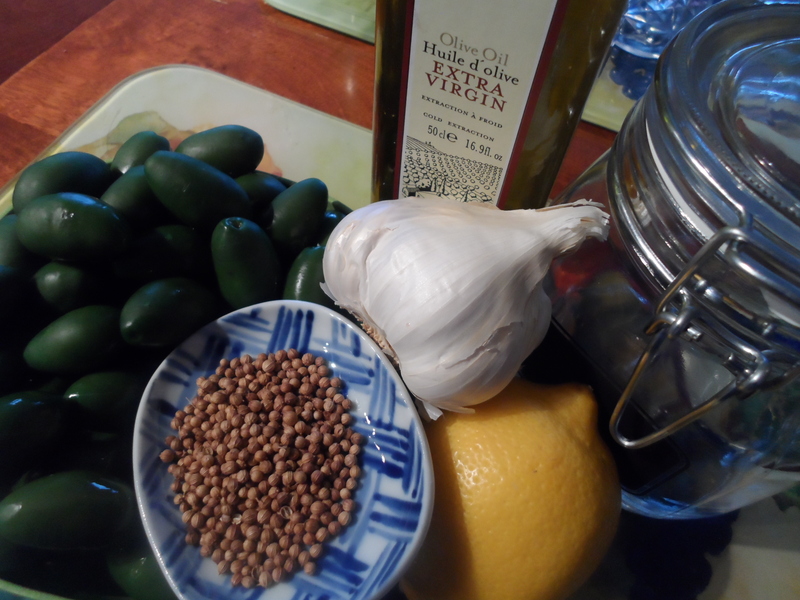 In this instance, I used a bottle of Boromeo Extra Virgin olive oil that I picked up at a recent trip to Olive & Olives. It only took 2/3 of the bottle to top up the jar that I decided to use for this recipe. This recipe requires that green olives that still have the pits in them, and have only been jarred in unflavoured brine ~ Greek ones if you can find them. Using soft olives that are stuffed with pimento or something else will not give you the same results. I could not find any green Greek olives but did find a huge jar of Italian Cerignolas at the bulk store in the bottom of the St. Lawrence Market. 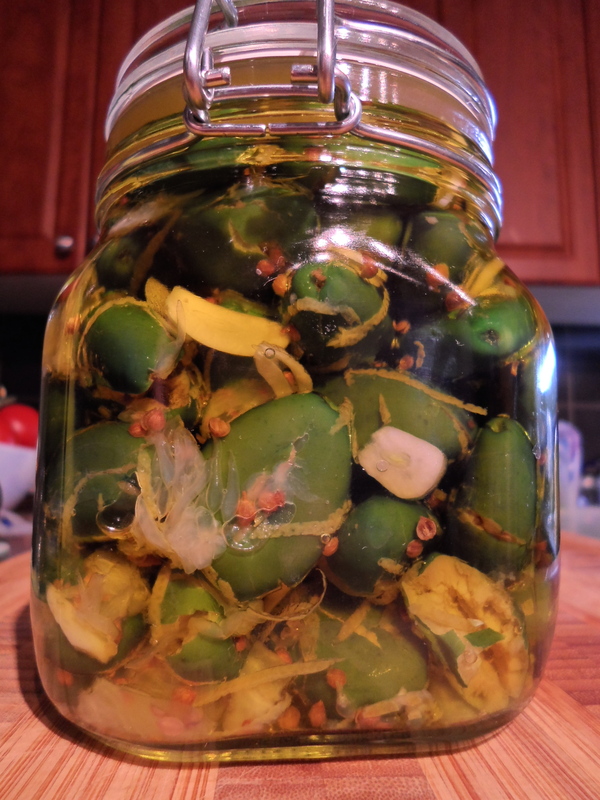 I’ll have to take a stroll through Greektown on the Danforth to hunt for some green Greek olives the next time I whip up another batch. Now, although we all know that olive oil is not at its best when kept in the fridge, that’s exactly where these olives should be kept. In this case, it’s ok to ignore that rule. Depending on the quality that you use, the olive oil will get thick and possibly cloudy. When you want to serve up some of these olives, just scoop some out and let them come to room temperature before you serve them. 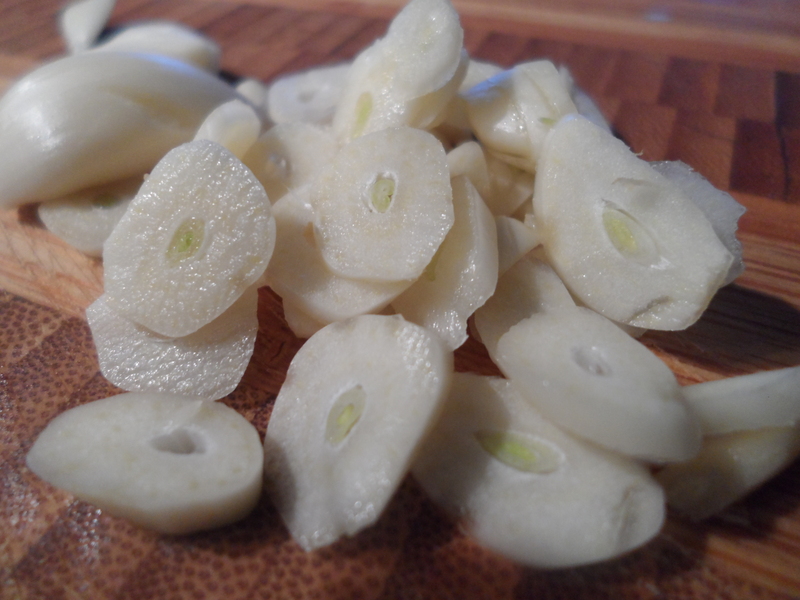 You can even pop them in the microwave for a few second to warm them up and melt the oil. The taste will mature the longer they are in the jar and they can last up to a month in the fridge. Let them sit for at least 24-48 hours (or longer) before you dig in. 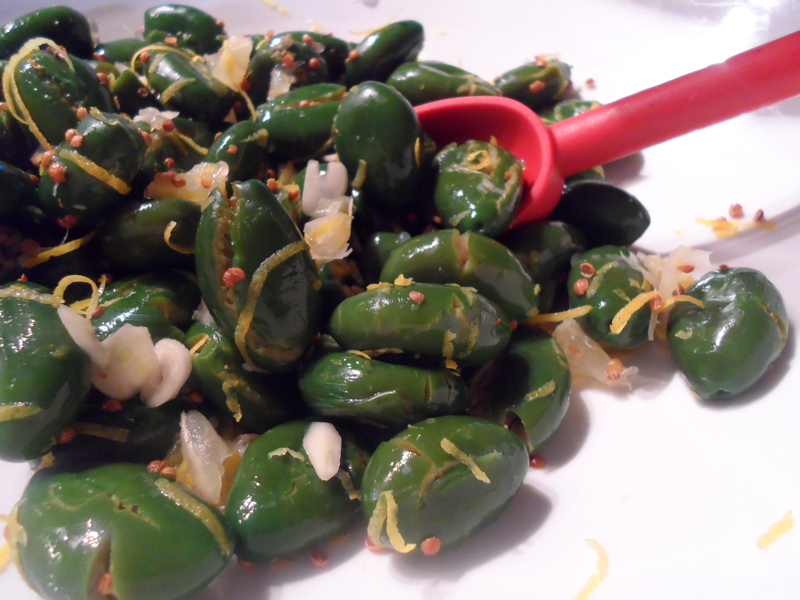 The following is my take on these tasty marinated olives. 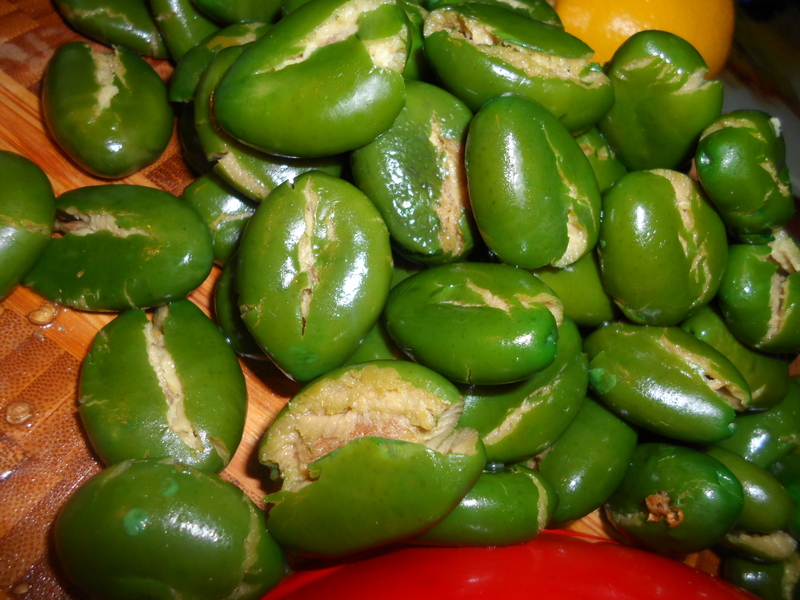 Rinse olives and lightly crush but do not break the pits. I used the bottom of a small frying pan. 2. 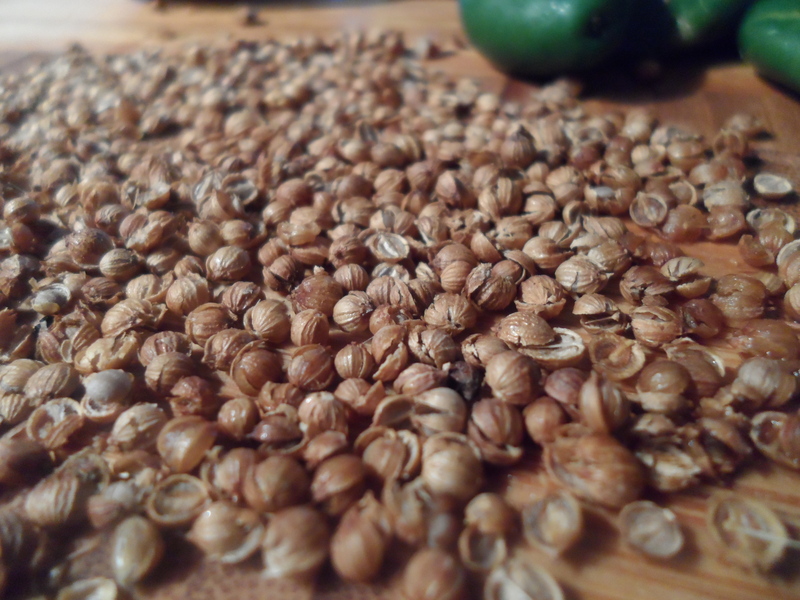 Lightly crush the coriander. 4. Zest the lemon. 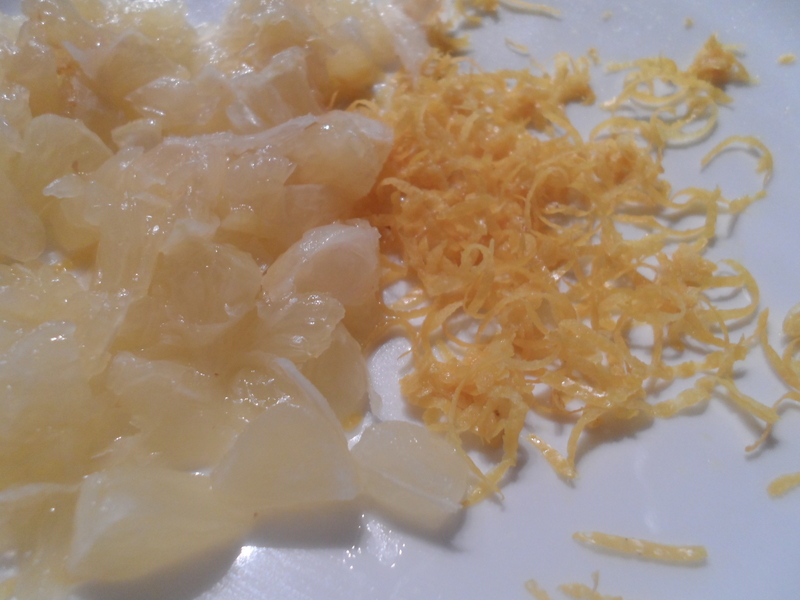 Remove the skin and as much pith (the bitter white layer between the yellow outer skin of the lemon and the actual fruit) as possible. 5. Dice up the fresh lemon. 6. Toss all ingredients in a bowl and mix well. 7. Put ingredients into a jar or container that has a tight fitting lid. 8. Pour enough olive oil to cover completely. 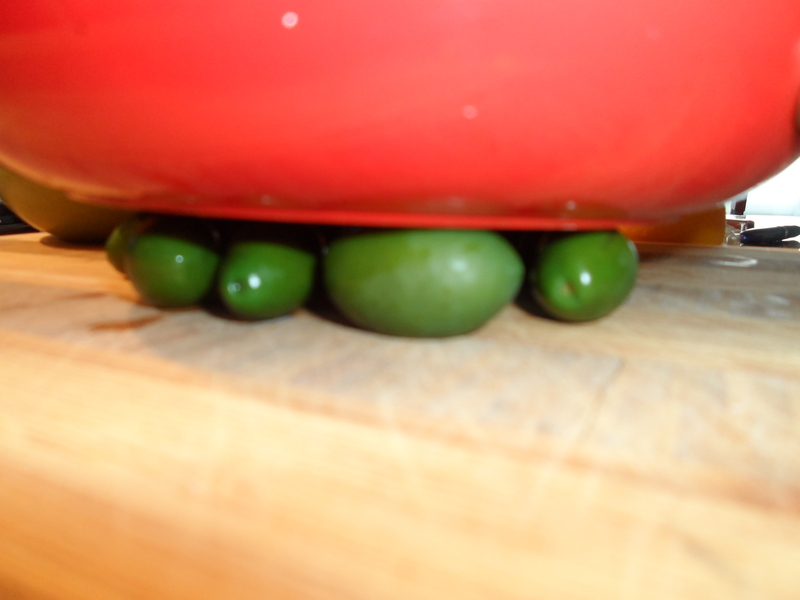 Use a skewer, or long thin knife to move the olives around a bit so that there are no air bubbles. 9. Close container and put in fridge for at least 24-48 hours. Eat them on their own or add them to Bean or Potato salads. Use the oil for dipping your bread or use in salad dressings. If you can find them, a good Greek Olive is Kipriakes Eliés, but you can use Italian Cerignola or Spanish Gordal olives and get equally good results. 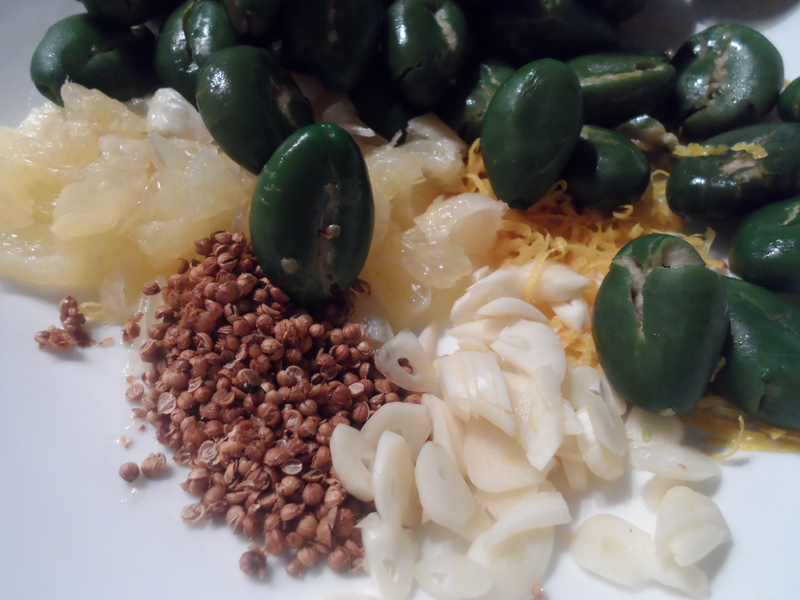 Posted in appetizers, coriander, garlic, Greektown, Lemon, Olive & Olives, olives, recipes, vegetarian recipesTagged coriander, garlic, lemon, Olive & Olives, olive oil, olives, recipes, St. Lawrence MarketBookmark the permalink. Dont U have to crack and place in water First, then water with salt, for a few weeks to a month, (while changing the water daily) BEFORE they are ready to be Marinated. Please explain. thanx. The olives I purchased have already been packed in salted water so that process has already been done. It saves the time it would take to have to do that step. With this brand of olives I can just rinse them and then proceed with the recipe.